When ideating a name, we hoped for something simple, easy to spell and pronounce in both English and Spanish. We also wanted a name that felt less obvious and with a hint of mystery or intrigue — something that felt rich and sensorial. In Italian, “senza” translates to “without” and “nome” to “name.” We are both very much inspired by the romance found in the Italian countryside and culture, and felt like the idea of “without” or “nameless” complemented our core principle of simple beauty quite well. Sometimes less is more and “senza” can help remind us of that. We also wanted a name that could be applied across a number of categories, including a farm, hotel, cafe or product line. After exploring a number of creative directions to take senza-nome, we resolved a set of final materials, a color palette, tone, typography and logo that we feel best suits our vision and will essentially be our working “design guide” going forward. 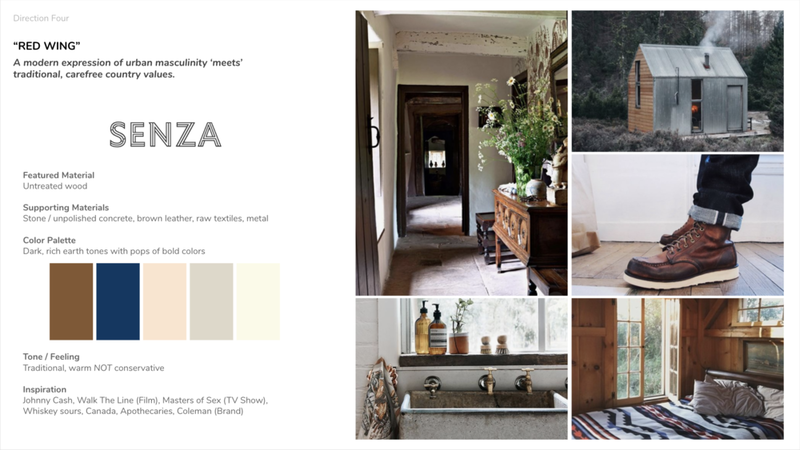 We had some idea of how senza-nome may come to life, although we felt it necessary to pull apart our ideas and craft four different “brand directions” for the homestead. Each exploration included a different set of inspiration, materials, color palette, tone, typography and logo that we felt may credibly deliver on our vision.